Just last Monday we checked out the trailer for Kiloo’s Frisbee Forever [Free], and were impressed with what looked like a bright, colorful, arcade-style game of frisbee flying. It was a pleasant surprise to see Frisbee Forever launch for free, though it does contain rather prominent IAP. It doesn’t appear anything will ever be required to be purchased in the game, as everything can be earned through just playing the game, it just looks like it will take a very long time to do so. Still, Frisbee Forever is an extremely well done game that is a ton of fun, and there’s no risk for giving the game a try. Frisbee Forever contains 10 different environments each with 10 levels for a total of 100. 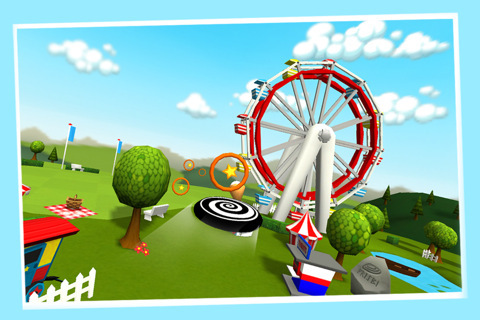 Flicking your frisbee will set it in motion and gameplay involves simply steering the frisbee left and right through each of the obstacle filled courses. There are touch or tilt controls, which both work nicely, and the elevation of your frisbee is handled automatically. Flying through various circular and triangular checkpoints will allow you to keep your momentum going until you reach the finish. As you fly through each course you’ll try to collect the many stars along your route, with medals awarded at the end based on how many you’re able to get. Most of the realism of flying a frisbee is dropped in favor of a more arcade-style gameplay. Your disc will fly through loops, corkscrews, and perform other feats that would otherwise be impossible in real life. This serves to make the game a lot of fun. Just trying to hit every checkpoint and stay airborne until the end of a level can be tricky, and the medals awarded for collecting stars give it that “one more try” element. As for the monetary portion of the game, for every 3 stars collected in a level, whether you complete the level or not, you’re awarded a star coin. These coins are then used to purchase additional discs, upgrades for your frisbee, and unlock additional worlds. Naturally, these star coins can be bought as IAP in various denominations if you aren’t patient enough to earn the coins yourself. Given the rate at which you earn star coins and the prices of many of the shop items, it will take an extremely long time to buy everything available without buying coins through IAP, though it’s possible. One strange thing to note is that there’s an option in the shop to disable ads in the game for $2.99, though I have yet to encounter a single ad in the game. A few players in our forums are getting ads in between levels, though the majority are not. It’s likely that there is a bug with the way ads are supposed to be displayed, and at some point they may end up appearing in the game, so just be aware of that possibility. Overall I’m having a great time with Frisbee Forever, and it’s definitely a high quality production. It will take a ridiculous amount of grinding in order to get all of the content in the game, but thankfully the game is fun so I’ll be playing it a lot anyway. There are some seriously awesome discs among the 100 available to buy in the game that I’m already saving up for. Plus, I’m not opposed to throwing a few bucks in here or there to speed up the process.